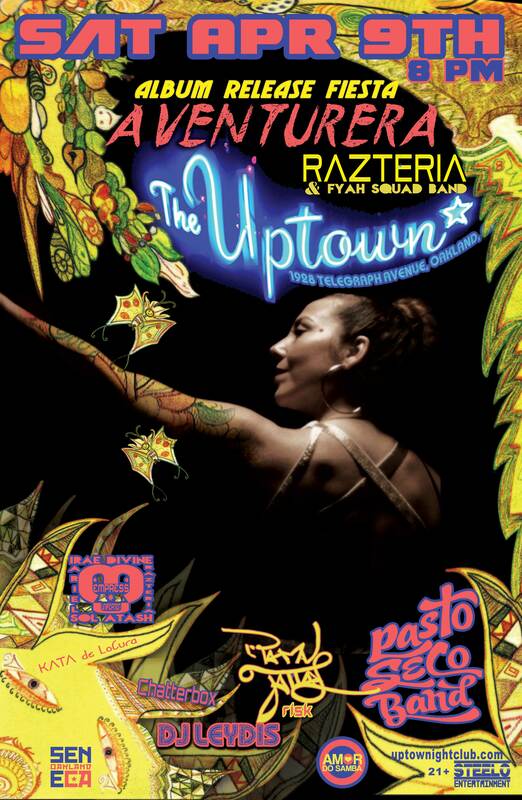 Bay Area Based Latin-Rock-Reggae Artist Razteria to Release Live In Concert her 5th Album, “Aventurera” Saturday April 9th @ THE UPTOWN – Saturday April 9th, 2016. On Saturday April 9th, 2016 artists from all over SF Bay Area and beyond are coming together in celebration of the release of Razteria’s new album Aventurera. The all-star line up includes DJ Leydis, performances by Pasto Seco Band, an East Bay based South American fusion band, Redwood city based rapper Rahman Jamaal together with Risk from Sao Paulo of Street Music Poetry, Kata of of international revolutionary party band LoCura, the Fyah Squad Band, Jackeline Rago on Venezuelan cuatro, Irae Divine, Sol Atash and Ariel of the collective Empress Unification, Seneca of Earthamplified, Chatterbox of Puppetplex and to top is all off, featured dance performance by Tanilee Amor’s Amor do Samba Brazilian dance troupe! Jackeline Rago is the artistic and musical director of the “Venezuelan Music Project” (Venezuelan Folk music, www.venezuelanmusicproject.com) and a founding member of the”VNote Ensemble” (formerly The Snake Trio,www.vnotensemble.com), bands which she travels and performs with in an ongoing basis. She was also a founding member of “Altazor” (Nueva Canción ensemble),” Wild Mango” (world beat music), “Keith Terry & Crosspulse” (world percussion) and “Trio Altamira” (contemporary Latin American music).